The next Grand Cherokee, shown here as a prototype, will arrive next month. DETROIT -- Jeep is pricing the base four-wheel-drive model of the 2011 Grand Cherokee, the Laredo 4x4, at $32,995, $465 less than the equivalent 2010 model. Prices include shipping. 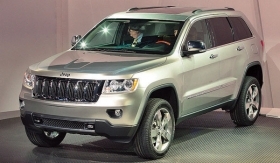 The Chrysler Group began making Grand Cherokees at its Jefferson North Assembly Plant in Detroit this week. The vehicles will begin arriving in showrooms next month. The Grand Cherokee comes in three models: Laredo, Limited and Overland. The Limited 4x4 starts at $39,995, and the top-of the line Overland starts at $42,995. Chrysler dealers have been waiting eagerly for the Grand Cherokee, the first vehicle redesign since the company emerged from bankruptcy last June 10. Jeep also sells the Grand Cherokee in rear-drive-only versions. Those 2011 starting prices range from $30,995 for the Laredo, down from $31,490 for the 2010 model, and $37,495 for the Limited, down from $40,200 for the 2010. There is no 2010 Overland. Base models will be the first Chrysler vehicles equipped with Chrysler’s 3.6-liter Pentastar V-6 engine, which the company says will deliver 23 mpg. The Grand Cherokee is available with a new air suspension that allows the vehicle to be raised and lowered for different on-road and off-road conditions. The Selec-Terrain system is a traction control system with settings for a variety of conditions from dry pavement to sand to snow to rocks. The pricing follows Chrysler’s recent policy of holding the line on prices while including more content.